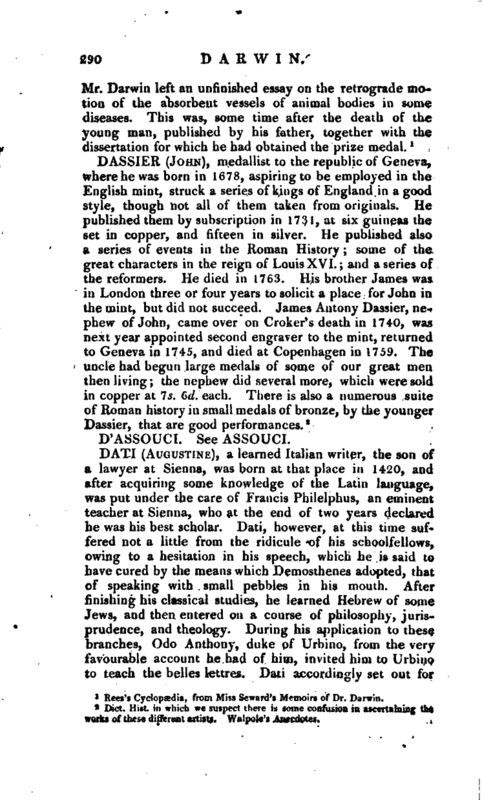 , a physician and poet, was a native of Elton, near Newark, Nottinghamshire, where he was born December 12, 1731. After going through the usual school education, under the Rev. Mr. Burrows, at the grammar-school at Chesterfield, with credit, he was sent to St. John’s college, at Cambridge. 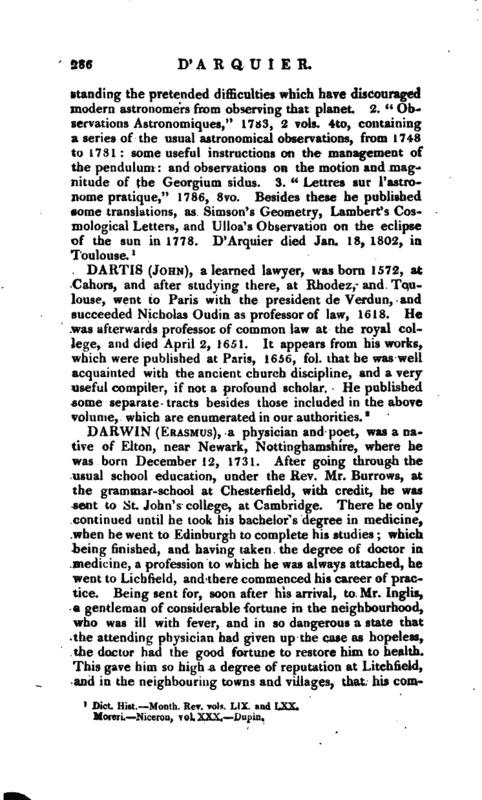 There he only continued until he took his bachelor’s degree in medicine, when he went to Edinburgh to complete his studies; which being finished, and having taken the degree of doctor in medicine, a profession to which he was aUvays attached, he went to Lichfield, and there commenced his career of practice. Being sent for, soon after his arrival, to Mr. Inglis, a gentleman of considerable fortune in the neighbourhood, who was ill with fever, and in so dangerous a state that the attending physician had given up the case as hopeless, the doctor had the good fortune to restore him to health. This gave him so high a degree of reputation at Litchfield, and in the neighbouring towns and villages, that his | competitor, who was before in considerable practice, finding himself neglected, and nearly deserted, left the place. Dr. Darwin soon after married miss Howard, the daughter of a respectable inhabitant of Lichfield, by which he strengthened his interest in the place. 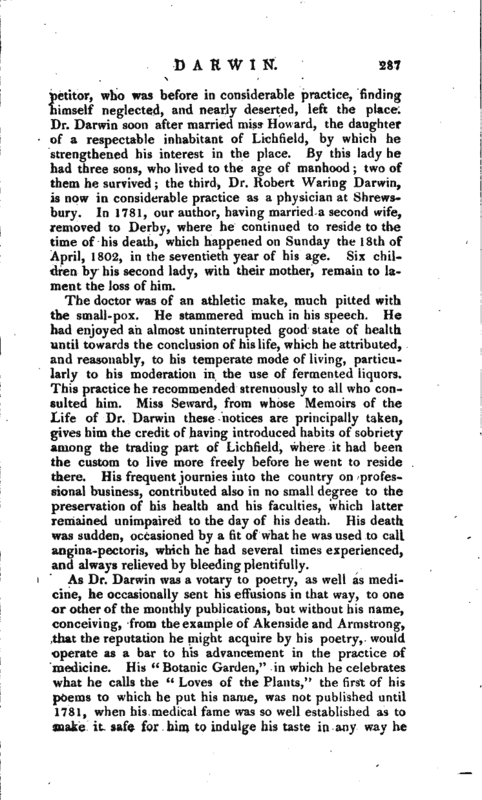 By this lady he had three sons, who lived to the age of manhood; two of them he survived; the third, Dr. Robert Waring Darwin, is no.v in considerable practice as a physician at Shrewsbury. In 1781, our author, having married a second wife, removed to Derby, where he continued to reside to the time of his death, which happened on Sunday the 18th of April, 1802, in the seventieth year of his age. Six children by his second lady, with their mother, remain to lament the loss of him. The doctor was of an athletic make, much pitted with the small-pox. He stammered much in his speech. He had enjoyed an almost uninterrupted good state of health until towards the conclusion of his life, which he attributed, and reasonably, to his temperate mode of living, particularly to his moderation in the use of fermented liquors. This practice he recommended strenuously to all who consulted him. Miss Seward, from whose Memoirs of the Life of Dr. Darwin these notices are principally taken, gives him the credit of having introduced habits of sobriety among the trading part of Lichfield, where it had been the custom to live more freely before he went to reside there. His frequent journies into the country on professional business, contributed also in no small degree to the preservation of his health and his faculties, which latter remained unimpaired to the day of his death. His death was sudden, occasioned by a fit of what he was used to call angina-pectoris, which he had several times experienced, and always relieved by bleeding plentifully. 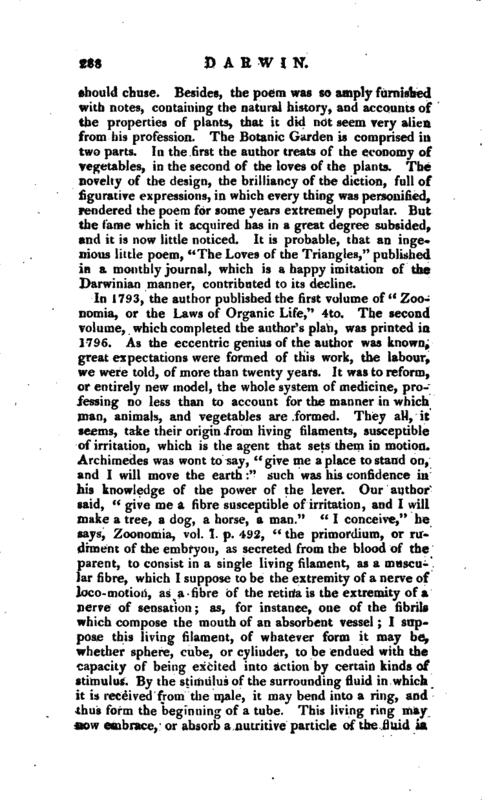 As Dr. Darwin was a votary to poetry, as well as medicine, he occasionally sent his effusions in that way, to one or other of the monthly publications, but without his name, conceiving, from the example of Akenside and Armstrong, that the reputation he might acquire by his poetry, would operate as a bar to his advancement in the practice of medicine. His “Botanic Garden,” in which he celebrates what he calls the “Loves of the Plants,” the first of his poems to which he put his name, was not published until 1781, when his medical fame was so well established as to make it safe for him to indulge his taste in any way he | should chuse. Besides, the poem was so amply furnished with notes, containing the natural history, and accounts of the properties of plants, that it did not seem very alien from his profession. The Botanic Garden is comprised in two parts. In the first the author treats of the economy of vegetables, in the second of the loves of the plants. The novelty of the design, the brilliancy of the diction, full of figurative expressions, in which every thing was personified, rendered the poem for some years extremely popular. But the fame which it acquired has in a great degree subsided, and it is now little noticed. It is probable, that an ingenious little poem, “The Loves of the Triangles,” published in a monthly journal, which is a happy imitation of the Darwinian manner, contributed to its decline. 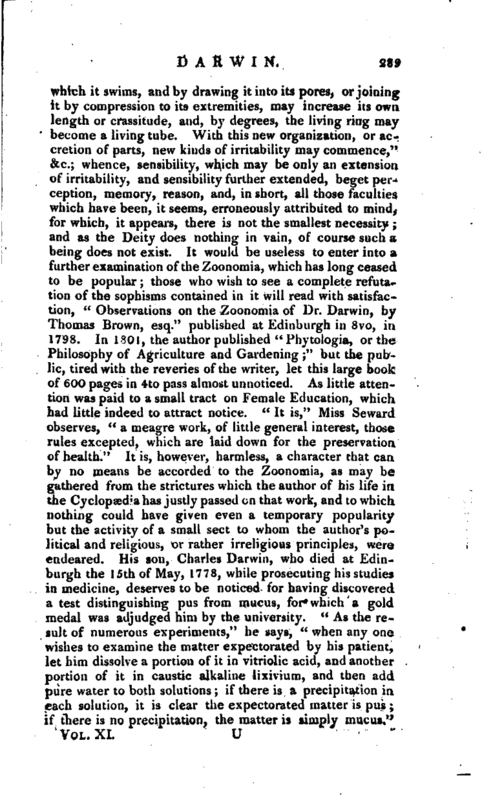 Rees’s Cyclopædia, from Miss Seward’s Metnoirs of Dr. Darwin.